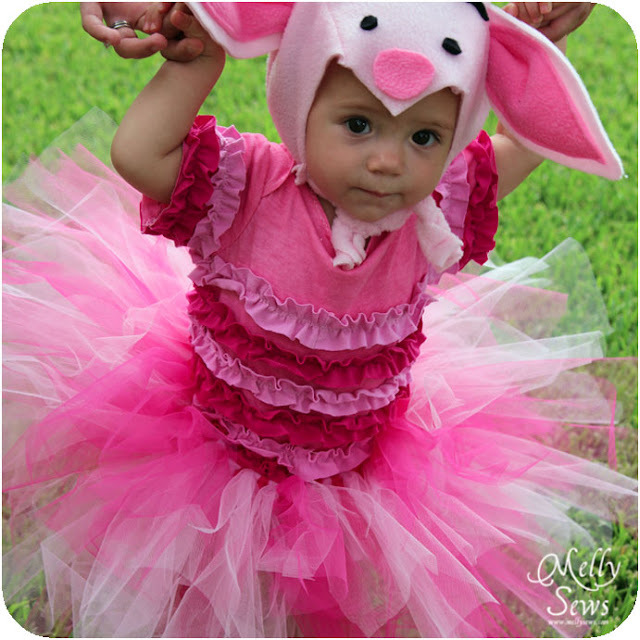 Today I’m going to show you how I made the ruffled onesie that my lil Piglet is wearing in her costume. 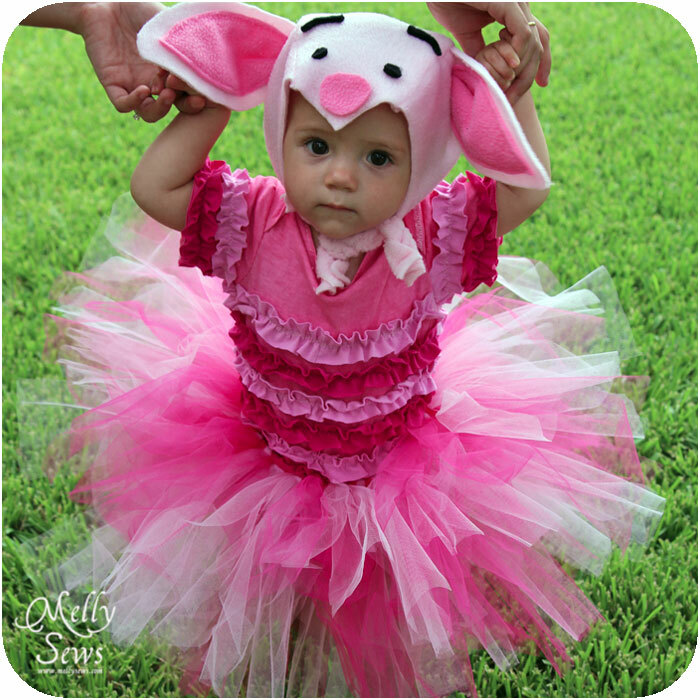 It’s great for the costume, but also could be used for daily wear. A onesie pattern. If you don’t have one, Dana has a good tutorial here for how to make one. 2-3 t-shirts, or approximately 1 yd of 60″ knit fabric. You’ll need one for the onesie and at least one for the ruffles. 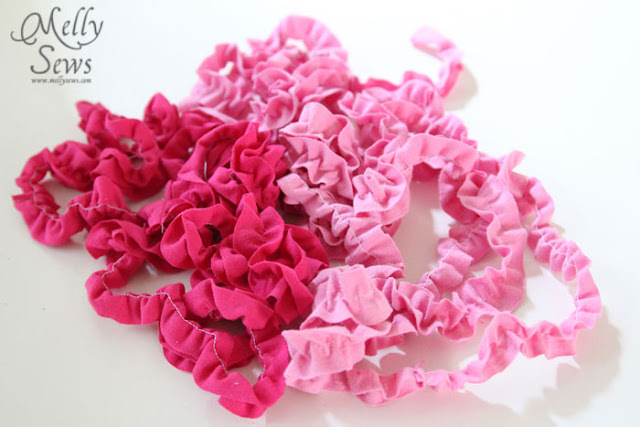 I used 3, but had the top half of each of the ruffle ones left over. 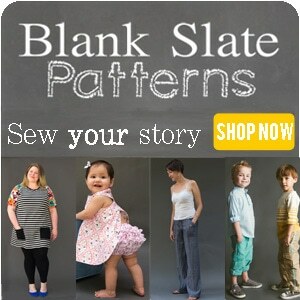 Start by cutting out your onesie pieces – front, back and two sleeves. Next, you’ll cut out ruffles. I did 1 1/4″ inch wide strips of my t-shirts. 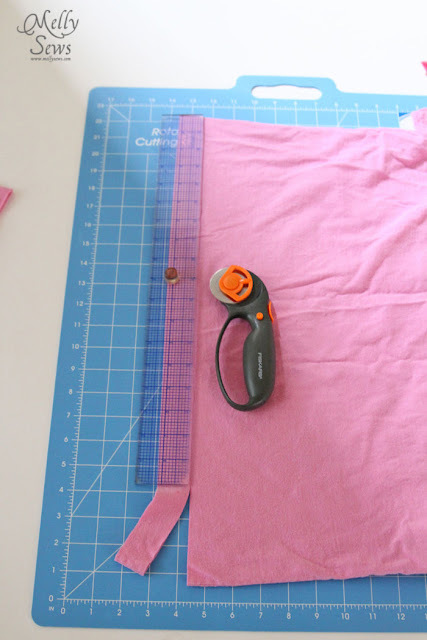 Sew your fabric strips into one very long strip. To make the ruffles, I loaded my bobbin with elastic thread, and then just sewed down the center of each ruffle strip. The elastic thread will cause the fabric to ruffle down the center. 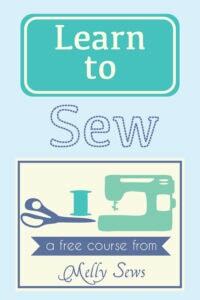 If you’ve never sewn with elastic thread, it’s really easy; this is a good introduction. Sew your onsie front to the back along one side seam. 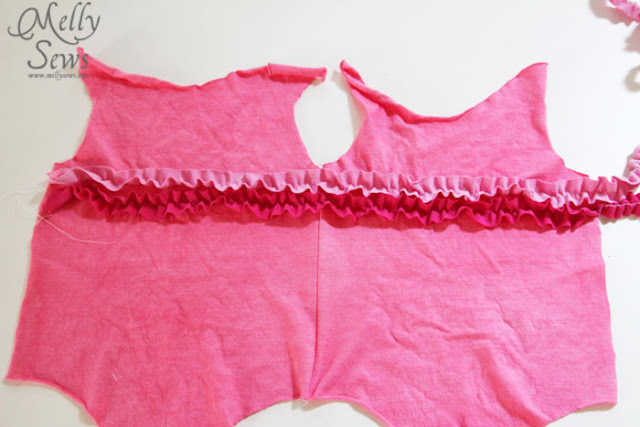 Then begin to place the ruffle in rows, cutting the ruffle each time you get to the end of the onesie. 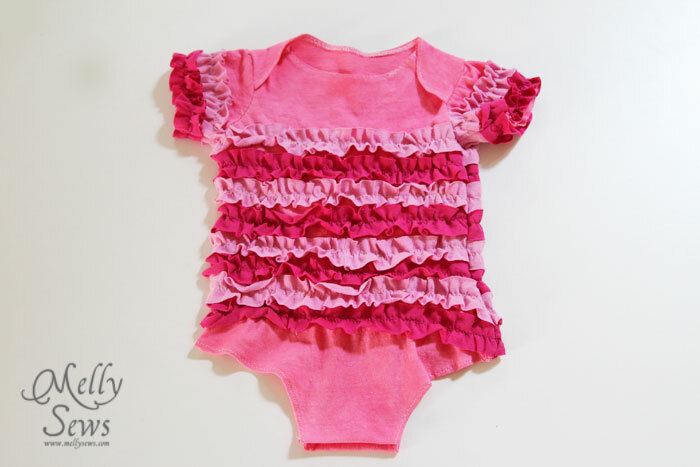 You can stitch the ruffles in place two at a time, or keep pinning and do them all at once. 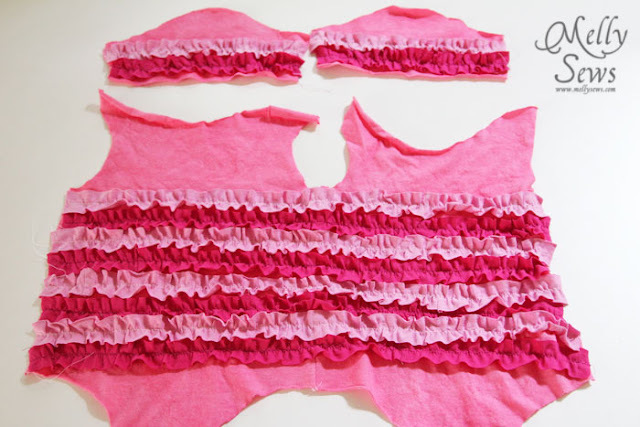 Sew down the center of each ruffle with a narrow zig-zag stitch. Don’t forget to do the sleeves. Sew the other side seam, then turn under the neck and leg edges and zig-zag to hem them. Finish assembling your onesie as normal (Dana has another tutorial here that explains the sleeves). Then I folded under the bottom edges and applied snaps. 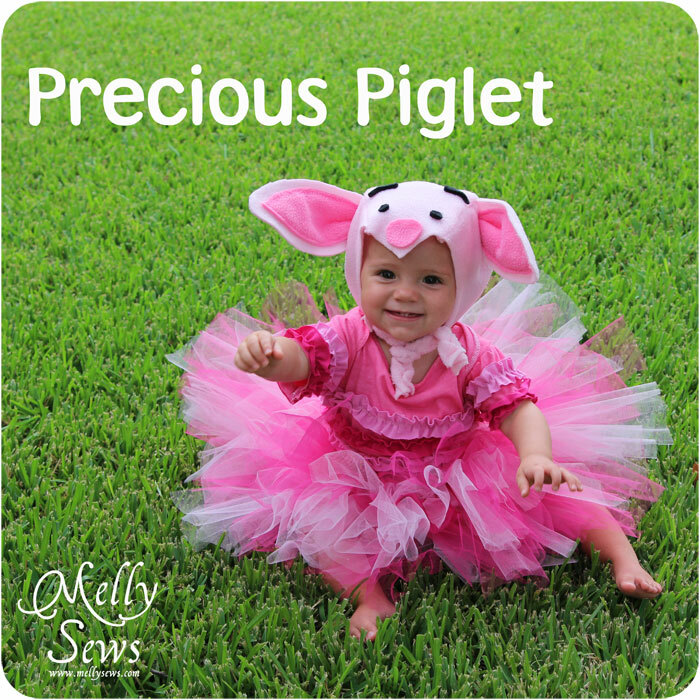 Voila – one precious piglet onesie! This is adorable:) thanks for the tutorial!!! sooooooo precious, she is adorable as little piglet!